It is very difficult to critique poetry,* but as far as I can tell, David McFadden has all his bases covered. He knows his craft well. 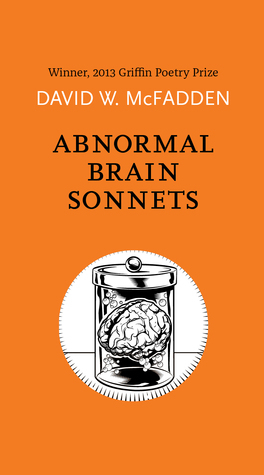 Abnormal Brain Sonnets is a collection of exactly what it sounds like− sonnets coming from his abnormal brain. These are well constructed poems centered on thoughts and memories from his past. Some of the subject matter is contemplative, some funny and some gloomy or even off-putting. McFadden stays true to himself and isn’t worried about causing offense. [Insert memories of fondness for a childhood teacher here]. Based on the description, I originally expected the collection to become a fairly linear storyline of thoughts and feelings throughout the poet’s life, but that is not what I experienced. The book is divided into three sections, each very different, and an interview with McFadden (unrelated to this collection) is attached at the end, but I don’t think it added a great deal of value. The work stands strongly without that added support, and the interview was a bit too congratulatory for my liking.I would recommend this to poetry appreciators looking to try something a little different. Believe me, it’s different. I have to say not all of the subject matter was to my exact taste. However, this collection deserves credit for its blending of depth and whimsicalness and credit is also due for McFadden’s writing and its deviation from the norm. *I received and am reviewing this book through Goodreads First Reads program. Unusual enough to keep me interested. Deep enough to stir memories of my own.